Learn how some of the closest disciples first encountered the Autobiography of a Yogi. It was in December 1946 that the first copies of Autobiography of a Yogi arrived at Self-Realization Fellowship International Headquarters from the printer in New York. On the occasion of the book’s 50th anniversary in 1996, several of Paramahansa Yogananda’s close disciples who were still with us shared their reminiscences of the day the books arrived and the impact it had on their lives. They were among the first to experience the divine wisdom, love, and transforming vision of life emanating from its pages — pages that since then have changed the lives of millions. The writing of Autobiography of a Yogi was a project that took many years of Paramahansaji’s time to complete. When I came to Mt. Washington in 1931, he had already begun work on it. Once when I was in his study attending to some secretarial duties for him I was privileged to see one of the first chapters he wrote — it was about “The Tiger Swami.” Gurudeva asked me to save it because it would be going into a book. However, the greatest portion of his autobiography was composed during the period 1937–45. Paramahansaji had so many responsibilities and commitments, he was not able to work on his book every day; but in general, he devoted the evenings to it, as well as whatever other free time he was able to put his mind on it. A small group of us — Ananda Mata (below), Shraddha Mata, and myself — were around him much of that time, helping to type the manuscript. After each part was typed, Gurudeva would give it to Tara Mata, who served as his editor. Gurudeva’s reaction to the completion of the book was joy that no words can express. He inscribed my copy, as he did for many of the other devotees who were here in the ashrams. When I received it, I knew, having helped to type the manuscript, that this was an immortal book — one that for the first time revealed hidden truths which had never before been presented in such a clear and inspirational way. No other author has approached Guruji’s explanation of miracles, reincarnation, karma, the afterlife, and the other wonderful spiritual truths contained in its pages. What would be his reaction to the book’s renown today? He would be humbly touched that Autobiography of a Yogi has reached into all corners of the earth to people of every culture, race, religion, and age, and that it has been received with tremendous acclaim and enthusiasm throughout these fifty years. Though Guruji never dwelt on his own importance, he certainly did believe in the great value of what he wrote — because he knew he was writing Truth. Book inscribed for Tara Mata (Laurie Pratt). In a tribute that appears in the Autobiography of a Yogi’s Author’s Acknowledgments, Paramahansaji conveys his appreciation to Tara Mata for her part in editing his manuscript. The inscription in her copy of the book gives insight into the deep regard he had for the service of this valued disciple. One evening in the Encinitas hermitage, late in 1946, we younger devotees were busily engaged with our kitchen duties when Gurudeva came through the door. All activity stopped and our attention was fully concentrated on his broad smile and an even more beautiful than usual twinkle in his eyes. His hand was behind his back, concealing “something.” He called for a few others to come and had us line up in front of him. Then he displayed before us the hidden treasure — an advance copy of his book, Autobiography of a Yogi. Midst “Oh’s” and “Ah’s” we could scarcely express our joy to behold at last the long-awaited account of his life among the great saints and sages of India — with which he had so often enthralled us during precious hours in his company. He opened to a few pages, saving for last the illustration of Mahavatar Babaji. Almost breathlessly we offered our reverence and absorbed the blessing we felt to be among the first to glimpse the likeness of our Param-Param-Paramguru. In early December, we were all summoned to Mt. Washington to participate in the arrival of parcels of books from the publisher, and in preparing them for posting to the many eager devotees — hundreds of back orders. Weeks ahead of time when any of us had free moments we were engaged in typing address labels on one of our old manual typewriters. Huge tables (flat boards on sawhorses) were set up in the office, ready for assembly-line wrapping of each individual book in brown mailing paper off a huge roll, hand-cutting it to just the right size, affixing labels and postage stamps moistened first from wet sponges. No automation or mailing machines in those days! But oh what joy to participate in this momentous event in Self-Realization Fellowship history. The world would know our blessed Master through this sublime ambassador. In the third-floor sitting room, Gurudeva sat at a desk for hours without a break, autographing every book. The books were removed from the publisher’s shipping cartons, opened, and placed before him in a steady stream as he signed each one — emptying one fountain pen while another was being refilled. It was late when he summoned me to come upstairs. He was still autographing books. The senior disciples urged him to take some rest, but he refused even to consider it until every book in that shipment was signed with his blessings. He had the most beatific expression on his face, as though a very real part of himself and his love for God were going out to all the world in those printed pages, and it should not be withheld one extra moment. It was with inexpressible joy that we sat at his feet to meditate in the wee hours of the morning. The Master had handed each of us our personal copy of this treasure, and all other copies had been wrapped for mailing in the morning or packed for sending to his temples in Hollywood and San Diego. Autobiography of a Yogi was on its way to a divine destiny, ultimately to carry the Guru’s blessings and love for God to millions of seeking souls. There were just a few of us living in the Encinitas Hermitage when Paramahansaji was writing Autobiography of a Yogi, a project that took him a number of years to complete. I was living there for part of that time. Guruji did most of the writing of that book in his study at the Hermitage. I remember there were times when he might dictate all night long, and other occasions when it would continue for the entire day or even longer. I was not involved with the secretarial duties like Daya Ma and Ananda Ma, who would sometimes take down his words in shorthand and at other times use the typewriter. My responsibility was mostly cooking their meals so that they could work uninterruptedly! When Autobiography of a Yogi arrived from the publisher, there was great jubilation. Right away Guruji wanted us to send out his book to all those who had placed advance orders! So after the initial celebration, we were very busy filling the big backlog of orders that had accumulated. Sister Shila and I wrapped many copies, stamped the packages, and got them all ready. Then we brought the car around, opening the trunk and all of the doors. When the car had been completely filled, we drove the parcels of books down to the main post office in Los Angeles. We were delighted: At last Autobiography of a Yogi was going to be available to people everywhere! Shortly after I entered the ashram in 1939, Paramahansaji spoke with a couple of us on the verandah of the Administration Building at Mt. Washington. He remarked to us that God told him he was to write certain books during his lifetime; and when those books were finished, his mission on earth would be over. Autobiography of a Yogi was one of those books. When the Autobiography first came out, I read it from cover to cover in a day, or two — how wonderful and inspiring! I remember thinking that this book will play a major role in promoting interest in Paramahansaji’s teachings. To date we have seen only the tip of the iceberg. When I met Paramahansa Yogananda in 1943 I was nine years old. My father was a Self-Realization Fellowship member and attended services at the temple in San Diego. In 1947 I read his copy of Autobiography of a Yogi, which Paramahansaji had given him. My father was very unassuming and never tried to influence others with his own beliefs. As a result, he never even showed me the book — I came across it accidentally. It took me a while to read it — I was quite young and the book contained some rather large words! But from the beginning, Autobiography of a Yogi has been a haven for me, a healing balm for my soul....Above all, Autobiography of a Yogi shows that it is possible for us to know God. I remember my first Christmas in the ashram in 1946. Autobiography of a Yogi was completed, and Paramahansaji gave copies to all of us. How powerfully those pages conveyed our Guru’s vivid and delightful personality — the love and joy we felt in his presence. How uplifted we had been hearing him recount many of those same events personally, and through this book all can share in that. I vividly recall when Autobiography of a Yogi was first released. Some time later I asked Paramahansaji if he would write a little thought in my copy. He wrote, “Find the Infinite hidden on the altar of these pages.” Sometimes when I’ve had a specific need, I have opened the Autobiography to some passage and thought, “I don’t remember ever seeing that before!” But it exactly addresses what I had to deal with at the moment. Though I would not have known where to go in the book to find it, it leaps off the page when I need to see it. I have found that the Master’s counsel is really true — you can find the Infinite hidden on the altar of those pages. “This book will be my messenger....” Thus did Paramahansa Yogananda prophesy the role of his Autobiography of a Yogi in drawing souls from around the world to the sacred path of Kriya Yoga he had been ordained to spread worldwide. Following are accounts from three of the countless souls for whom the book has indeed served as the Guru’s messenger — during his lifetime as well as after his passing. I was in my early teens when I spent a summer vacation with an aunt and uncle in the suburbs of Winterthur, one of the larger cities in Switzerland. My uncle was a musician, a member of a symphony orchestra. He too was on vacation, which he spent working in his large garden. I helped him. Since they didn’t have any children, my uncle took a great interest in me, and during the garden work there were long “talking sessions.” My uncle, I found, was deeply interested in Eastern philosophy, and I listened with rapt attention to his discourses on karma, reincarnation, the astral and causal planes, and particularly on saints — masters who had attained illumination. So I began to pray for a guru. My yearning for a master was so great that, after I had returned to my hometown, I used to go to the train station, waiting for hours, in the hope that “he” would come. But nothing happened. After I finished my schooling, I worked in my father’s business for two frustrating years. By then, I had given up my interest in Hindu philosophy, since it seemed hopeless that I could find a guru. I embarked on a career in art, and after three years I was invited to go to the United States to study with Frank Lloyd Wright, the famous architect. “Yes, he lives in Los Angeles.” Then he told me how he had attended a series of lectures and classes given by Paramahansaji soon after he had come to this country. To think of it, all these years when I had been longing for a guru, my uncle had known a master and his teachings! I hungrily read the book. That was the first miracle. I was so fascinated that I didn’t even notice that this in itself was a miracle — I didn’t know enough English to read a book in that language. Frank Lloyd Wright too had written an autobiography, but I had tried in vain to read the first couple of pages. It took me a whole additional year of learning English before I was able to read that book. Yet I had been able to read Autobiography of a Yogi from cover to cover. I knew in my heart that I had found what I wanted, and made up my mind to study the teachings of Paramahansa Yogananda and find God. It was some months later, after I had learned more English, that I was able to make a trip to Los Angeles, hoping to see the Master. As I entered the grounds of the Mother Center, I felt an overwhelming peace, like nothing I had ever experienced anywhere before. I knew I stood on holy ground. Sunday morning I attended Paramahansaji’s morning service at the Hollywood Temple. It was the first time I would see him face to face. It was an unforgettable experience. After the service, the Master sat on a chair and most of the congregation went up to greet him. I can’t express in words how I felt as I stood in line. Finally when I stood before him, he took my hand in his and I looked into those deep luminous tender eyes. No word was spoken. But I felt an indescribable joy coming into me through his hand and eyes. I left the temple and walked in a daze along Sunset Boulevard. I was so intoxicated with joy that I couldn’t walk straight. I tottered like a drunkard. Not only that, but I couldn’t contain my joy within, and kept laughing out loud. People on the sidewalk turned and stared; and those walking toward me moved off to the side, shaking their heads in disgust over what they assumed was public drunkenness on Sunday morning. I didn’t care. I had never been so happy in my life. Not long after this experience, I entered the Self-Realization Fellowship ashram as a monk. A monastic disciple of Paramahansa Yogananda for more than thirty-five years, Self-Realization Fellowship minister Brother Premamoy was responsible for the spiritual training of young monks of the Order until his passing in 1990. To them he recounted this story. Brother Premamoy was born in Slovenia. Because of his family connections with royalty and others of influence, after the Communist takeover of his native land at the end of World War II he was forced to flee. In 1950, the U.S. Department of State invited him to immigrate to America. Just before sailing to New York in the fall of 1950, Brother Premamoy was given a farewell gift by an old friend of the family, Evelina Glanzmann. The present’s shape led him to assume it was a box of candy, and on board the ship he opened it to share with fellow passengers. To his surprise, the package was not candy, but a book — Autobiography of a Yogi. In America, he became involved in various business undertakings, and was eventually offered a position as personal assistant to Dag Hammarskjöld, Secretary General of the United Nations. (He declined the position before coming to California.) Months went by — and the Autobiography remained on the shelf, unread, at Brother’s home in New York. In the meantime, Mrs. Glanzmann (who was the translator of the Italian edition of the Autobiography) had been asking her friend’s opinion of the book. Still Brother Premamoy did not venture into its pages. Finally Mrs. Glanzmann wrote words to the effect: “Say you like it or say you don’t; but say something!” In a pensive mood — it happened to be his birthday, March 6, and he was pondering what to do with his life — he picked up the book and started to read. Spellbound, he finished the entire book in one sitting. 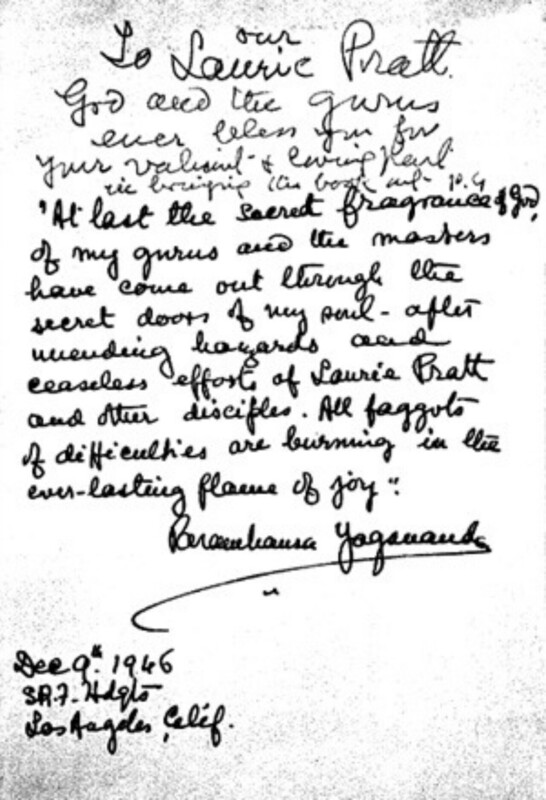 Recognizing that the author had spiritual insight beyond that of anyone he had ever encountered, Brother decided to write to Paramahansa Yogananda. Little did Brother Premamoy know that as he mailed the letter, the Guru was living the last day of his earthly life. Brother Premamoy learned of the Guru’s passing some time later, when Sri Daya Mata replied to his letter. Several months passed; Brother was unable to get the thought of the book and its author out of his mind, and that summer he decided to drive to Los Angeles to learn more about Paramahansaji’s teachings. As he walked onto the grounds of Self-Realization Fellowship headquarters for the first time, he was immediately approached by a smiling stranger. With a radiant smile, the man affectionately embraced him as if he were an old friend — long expected and most welcome. No words were exchanged, and it was only later that Brother was formally introduced to his new “old friend” — Rajarsi Janakananda, president of the society! Thus, the book that Paramahansaji spoke of as his “ambassador” performed its magic on one more soul — for from that day on, the course of Brother Premamoy’s life was set. It was 1952, and I was employed as secretary to the assistant manager at the Ambassador Hotel on Wilshire Boulevard in Los Angeles: a fascinating job in an elite setting where I met a number of world-renowned personalities. But little did I know the impact upon my life the sound of one name would make when spoken in my ear. The rest of that day I remained in a strange state of inner awareness and experienced a deep sense of connectedness to that name. Then came March 7, the fateful day of Paramahansa Yogananda’s mahasamadhi. I read about it in the paper and felt that I had lost my best friend. It was devastating! It seemed my life was suddenly over. I kept thinking, I’ve missed him! I’ve waited all my life for him and I missed him! But I didn’t really know what I meant because I wasn’t looking for a teacher or a path. Even so, in the depths of my consciousness I knew it to be true, that I had missed the most important person in my existence. From that moment on my well-ordered, rather glamorous life no longer suited me. I abruptly canceled important plans, stopped seeing people I knew and started seeking through books. It never occurred to me to see if Paramahansa Yogananda had ever written a book; I simply felt that he was gone and I had missed him. After reading four metaphysically oriented volumes which did not satisfy the depth of my need, I was again searching through the same row of books in the Hollywood Public Library with my mother, who had caught some of the fire that was burning within me. After almost passing the first section, which I felt I had already thoroughly perused, a book fell off the top shelf, hit me on the head, and bounced onto the floor. My mother picked it up and gasped as she turned it toward me — Paramahansa Yogananda’s Autobiography of a Yogi. There before me was the name my heart was reaching for, and the face with eyes that penetrated to the soul! I read it at night and she read it while I was at work. “Reading” is perhaps inadequate to describe the way we engrossed ourselves in the experience of entering the world of Truth. The origin of life, discipleship, the dispensation of Kriya Yoga — all were made clear in Autobiography of a Yogi. We attended a service at the Hollywood Temple, which overwhelmed me with the same “presence” that had been so dynamic the morning I first heard the Guru’s name spoken on the telephone. After the service Meera Mata was very gracious in receiving us and after a few moments suggested that I go to Mt. Washington Mother Center and meet her daughter, Mrinalini Mata. We did go and learned about the monastic order, and I was “captured” for the third time — first by Paramahansa Yogananda, second by Autobiography of a Yogi, and now, by the ideal of a life of renunciation devoted to God alone. After recounting the story about the effect upon me of hearing Paramahansaji’s name on March 6, I learned he had been at the hotel on that morning attending a breakfast for the Ambassador from India, His Excellency Binay R. Sen. That breakfast took place in the room next to my office. The Master was sitting just on the other side of the wall from my desk at the time I received the call and heard his name. The Guru is calling all of “his own” through his tremendous autobiography. Some of us just take a little too long to respond and have to be hit over the head, as did I! But how blessed is each one of the millions who hears his “voice” and answers his clarion call.